At start you are able to choose the amount and velocity of your population seeds and winds. When this is done everything is spawned into a play field (In the screen saver mode this is being done by random from the start). When all the objects are in place the ecosystem comes to life and your goal is to keep it alive. The flowers gain energy every second which means that old ones are better than young ones. Every other second the flowers produce three seeds. When the seeds come in contact with the wind they grow up as flowers; spreading seeds of their own. Every flower has a max lifespan which is 16 seconds. The herbivores consume them by colliding with them. The herbivore needs flowers to survive but they too have a max lifespan that is 50 seconds. When female and male herbivores collide with one another the females lay an egg. 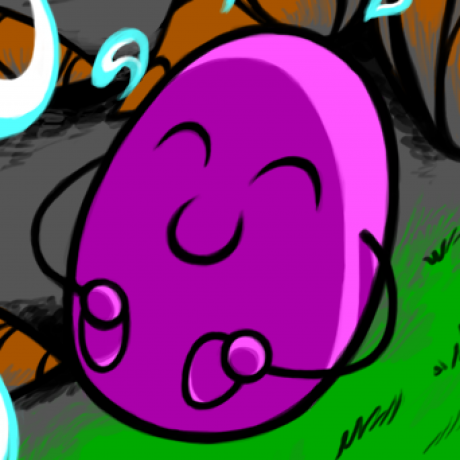 The egg gets her level of energy and velocity so that her childrens’ survival is some what depending on her earlier life. The egg hatches after 40 seconds giving birth to two cubs a male and female. Now everything goes round and round until the herbivores become too many or too few to sustain their own existence. Mass starvation or lack of population leads to extermination. In the game mode you are able to prevent this by killing and mutate individuals. Mutation is done by setting a counter to a number representing velocity and then clicking on an egg. The egg will bring the velocity to the male and female herbivores which are born from it. They then bring the velocity to the next generation. If the mutation is successful it might replace the earlier kind of herbivores by natural selection. This might both be good and bad for the entire population. Evolution has no mening; it doesn’t struggle for survival. In the screensaver mode mutation occurs randomly. In both the screensaver and the game you are able to watch general statistics about the population but in the game you can also watch individual statistics. And remember that this is only a simulation and not a true mirror towards nature. However I hope to awake some interest about nature and evolution in you. Now press that begin button! Why not just put both your screen save and game in 1 file and call it a day? Well, I wanted to do that but it seems that with TGF, you save in two different ways depending on if it is a game or a screen saver. Err... So you include both the game and the scr file in one zip? Hehe, I could do that but a lot of people that will download this from my blog wont know wich file should go where and so on. Strange, wonder what that is about. Hm, I might just listen to you guys about making it all in one zip. who is this phizzy loser? game looks interesting but you say 'Evolution has no mening; it doesn’t struggle for survival' but if the new generation have the speed of the parents then in a way it does - the slower animals will not reach the food as quickly as the fast animals so these slow ones should die off just leaving fast ones which will breed fast ones no? or have i misunderstood? Well, you are right ofcourse about that the outcome of their increased speed is survival because of natural selection as you point out. However, as well as in real life, that outcome (survival or reproduction) is only a logical consequence of their nature, not any intention or purpose. In nature, many organism do struggle for survival, but That's just another of those meaningless logical consequences of the nature of their genes AND current environment. In the simulator the herbivores, however, do not have any sophisticated behaviour. They only happen to get better chances to survive when their speed increase, like primitive organism on Earth. i see i see. very interesting!